Imagine this: you’ve got a beautiful bubbly starter, you’re ready to make the dough, and everything is set for an overnight rise. You’ve followed the recipe to a T! Nothing could go wrong. Except, when you wake up the following morning the dough has barely risen at all. Maybe only a few inches. The dough is cold, dense, and sort of lifeless (just like your mood). First, what you’re experiencing is totally normal. We’ve all been there no matter how easy the recipe might be. Just ask any baker. In my experience however, temperature is usually the main culprit and luckily there are ways to control it. But first, you’ll need to consider (and rule out) additional culprits that like to throw a wrench in your rise time game. What most people don’t know, is that sourdough is like a web; each step is connected to the next and when troubleshooting, it’s never just ‘one thing’ that causes your bread to flop. You have to consider how each step works together and what happens to the bigger picture when something goes wrong. First, let’s talk about your sourdough starter. If it lacks power and vibrancy, your bread won’t rise. So, how can you test to be sure it’s okay? doubled in bulk size (use a rubber band to track its growth as it begins to rise and fall). bubbles on the surface and throughout the culture. spongy texture similar to roasted marshmallows. You can find more info regarding sourdough starters, ongoing care, FAQ in my book (p 16-23). Once your starter shows all of the signs, make sure it passes the float test. To do the test, drop 1 tsp. of the starter into a glass of water; if it floats to the top it’s strong and ready to use. The more you get to know your starter the more it will ‘speak’ to you, and eventually you’ll bypass this test altogether. Assuming your starter is ready to use, the next step is to address the temperature. As mentioned above, temperature is usually the culprit when your dough is taking forever to rise. Why? Because temperature controls time. 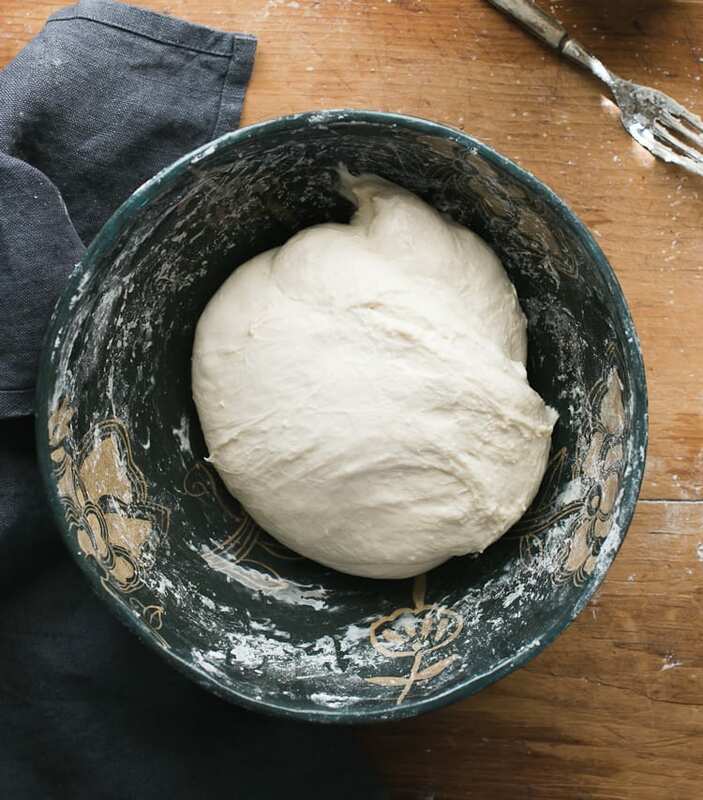 Simply put: if the weather is cold, your dough will take longer to rise. If the weather is warm, your dough will rise faster. This concept applies to ALL bread recipes, so get used to it and be flexible. As a guideline however, bakers will often provide a specific temperature with an approximate rise time to help you out. For the purpose of this post, let’s use my Everyday Sourdough from Artisan Sourdough Made Simple. The approximate rise time is 8-10 + hours at room temperature, defined at 70 F.
What does this rise time and temperature mean exactly? Let’s say it’s winter in New York, and the temperature is about -20 F outside. Your thermostat is set to 70 F inside. You’ve made the dough, let it rise overnight on the kitchen counter at 70 F, and in the morning it has barely risen. What happened? Here’s the deal: regardless of what your thermostat says, if it’s – 20 F outside, I can guarantee the temperature inside is not 70 F.
It’s most likely colder than you think! I learned this the hard way. Drafts, poor insulation, doors opening and closing etc. will not only change your current room temperature, but it changes the temperature of the dough too. My kitchen is the coldest room in the house, so I know this all too well. So, to remedy this, you’ll need to deviate from the recipe to suit your personal environment. In other words, in this example, your dough needs more time to rise beyond the 8-10+ hour timeframe- it’s just too cold. And this is okay. Remember, the dough is ready when it has doubled in size. This is your visual marker. Don’t even bother baking it if it still looks dense after 10 hours. Watch the dough and not the clock. Conversely, if you live on an island and it’s 90 F, the dough might be ready in only 4-5 hours. While colder temperatures and extended rise times might initially frustrate you, the experience will always hand you a gift. It develops your intuition and leads you away from second guessing yourself. Intuition is a baker’s secret weapon. With practice and repetition, you’ll learn how to marry the variables (time, temperature, specific instructions etc.) with intuition (adjusting rise times, rising locations, and just doing your own thing ) without thinking twice. If the weather is cold and your dough won’t budge, please use warm water during the initial mixing phase. It will help to jumpstart the rising process. I actually use warm water 90% of the time when making dough (I tend to use cooler water in the summer). The exact water temperature doesn’t really matter in my opinion. Between 80-90 F is good. It just shouldn’t be too hot. Use your judgement. Also: do you store your flour in the fridge? Some people do this to prevent bugs from nesting in the bag. If you fall into this camp, remember, cold ingredients = cold dough. The only way to really keep your dough at a constant temperature free of drafts and fluctuations is to use a proofing box. If you’re unfamiliar, proofing boxes are basically like mini green houses for your dough. You can set the box to your desired temperature and go about your day (or night) worry free. Except, they’re really not so mini come to think of it. These boxes are about the size of a microwave, they take up prime counter space, and worst of all- they are not cheap! I have a proofing box that collapses flat for easy storage, which I love but it cost over $150. The brand name is Brod & Taylor. If a proofing box is not an option for you, there’s an easy a way to create a bootleg version at home. To do so, adjust your oven to the lowest setting (mine is 200 F). Once it’s ready, shut it off. Stick an oven thermometer inside and wait for the temperature to drop to about 75-80F. Then place your dough inside (the bowl must be oven-proof, and a damp cloth should rest over the top to prevent a skin from forming on the dough). Allow to the dough rise in this warm, somewhat controlled environment until it has doubled in size. You can also use this tip for the dough’s second rise too. Note: Please make sure your oven does not go above 8o F. If the temperature is too hot, many things can happen that might wreck your dough. For example, extreme heat + cold dough creates excessive condensation, which leads to a wet and sticky texture. Wet and sticky dough is difficult to work with and shape. In fact, you might have to shape the dough more than once if it’s spreading too much. Extreme temperature can also lead to over-proofed dough, if the bowl is left inside of the oven for too long. And finally, too much heat might kill your starter power, resulting in flat and dense loaves. I’ve experienced all of the above factors and it’s really frustrating. My best advice? Please monitor your dough when it’s inside of the oven so you have an idea of what’s going on- all ovens are different, all doughs are different. Eventually, you’ll get a sense of how long the dough will take to rise and you’ll be able to make better adjustments as you continue to observe. So, let’s re-imagine this scenario once more: you’ve got a beautiful bubbly starter, you’re ready to make the dough, and everything is all set for an overnight rise on the kitchen counter. This time, you know it’s freezing cold outside and you have a hunch the dough might not be ready in the morning. Low and behold, you are correct. Quick to think, the following morning you create a proofing box using the oven trick mentioned above. In just a few hours the dough is soft, supple, and double in size. Once the dough is baked, you slice a piece of warm, crusty bread at just the right moment and inhale the aroma that has come from your creation. Go ahead, slather on some salted butter and revel in your newfound accomplishment! You deserve it! 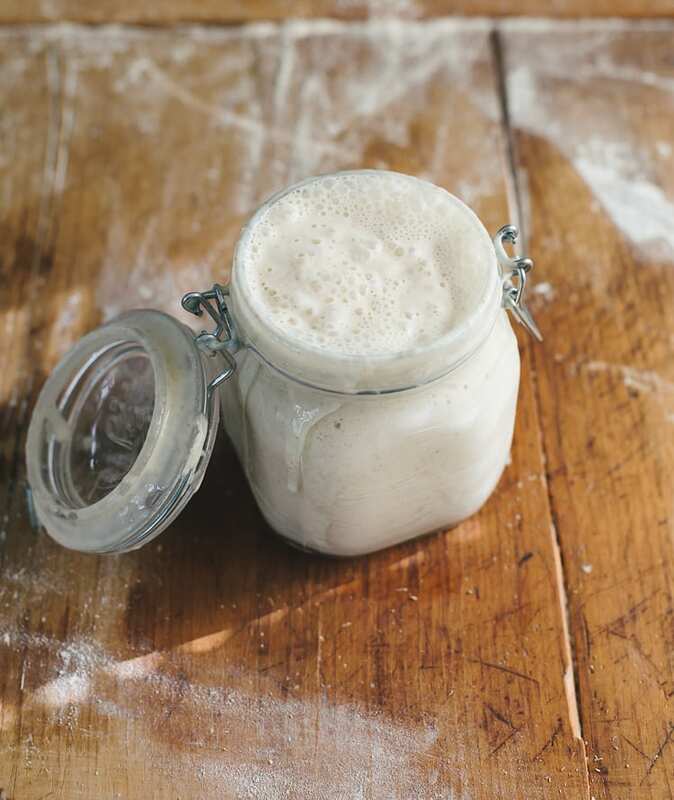 If you have questions regarding the rise of your sourdough starter, please click here. You’ll find everything you need to know over there! Can i successfully add yeast to my sourdough? I use a potato starter. Putting it in a glass if water to test it doesnt work because it is mostly liquid. Thanks for the help. Unfortunately, I’ve never worked with a potato starter and/or added yeast to my culture. If I were you, I would experiment. Perhaps you can pour out some of your starter in a separate jar, add the yeast, and see what happens? Good luck! Hi Vincenzo, this particular article does not refer to adding commercial yeast to sourdough; perhaps you are referring to one of the comments? 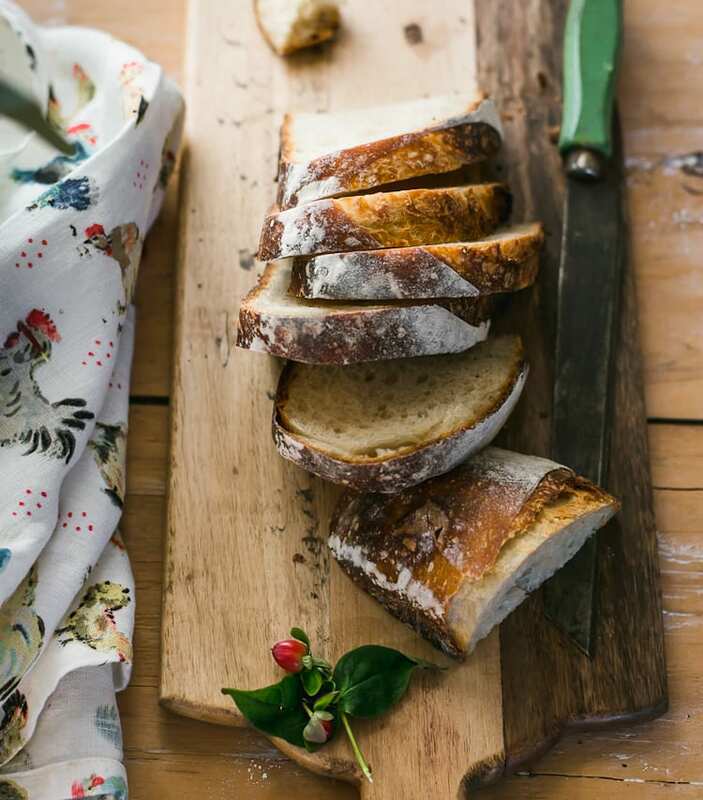 Some bakers (professional and home bakers a like) will add commercial yeast to sourdough to create a hybrid loaf to give the rise a guaranteed boost. This isn’t wrong necessarily; it’s just not pure sourdough bread. This of it like ordering a half caffeinated beverage from Starbucks ;) Hope this helps! I live in Southern Ca. and I love my Brod & Taylor home proofer. When things get slow or need an even controlled temperature I use my B&T . It folds up and slides into a kitchen draw when I’m done. I can’t say enough about it…other than check it out. If you live where it get’s cold. I couldn’t imagine not having one these proofer’s. I’m not a rep. for this little home proofer but, I do love baking sourdough breads, pizza’s and pastries. Thanks for this info Sylvia. I had never heard of this and just checked it out. Hi Melanie! I use the same proofer- I highly recommend it. Same here. Bros and Taylor folding proofer is the BEST. During winter here in North Texas, I use it regularly. Yeast bread, sourdough, or Ciabatta. Works great. Stores nice. All good. I solved the temperature problem by putting my covered bowl of dough in a black cardboard box that I set in the sun. I cut vents in the box so that the heat wouldn’t build up. Solar proofing box for about, oh, $1.59 tops. Worked like a charm. Wow! That’s such a cool idea! I’ve never heard of that before, Mim. Thanks so much for sharing that tip with us. I know what I’ll be Googling later, lol. the cold temperature in the dough. I have the old-fashioned steam heat radiators with wooden covers. My thermostat is set to 65 at night. I switched to covering the bowl with plastic wrap, placed the bowl on the radiator in my dining room at 10 PM, then covered the whole thing with a small blanket. When I got up at 5 AM, the dough had risen perfectly. I once opened a bag of flour, only to find stringy stuff in there from whatever bugs had invaded. Thanks for all your information Emilie. And Happy New Year. Hi Melanie! I remember you ;) In fact, I’m working on a sourdough starter post and I’ve referenced your tip re: kombucha heating pads to boost its rise time. Thanks again for that, by the way. Regarding the rise of your dough: all ovens are different so I’m not surprised it was cold inside the following morning. It happens. You know what you can try instead? Just leave the oven light on all night while the dough rises inside. This way, your oven won’t be cold or at least not as cold in the morning; the heat from the light should provide steady warmth for the duration of the rise. As with anything however, you’ll have to play around with this tip to see if it even works for your conditions. I did the light bulb trick last night… My oven gets super hot, so I only left it on for 4 hours, turned it off, and then let the dough rise overnight in the dark. In the morning, it was almost over proofed! On a different note- I love your radiator trick! I grew up with those steam heaters when I was a kid and I can totally imagine your setup. And yes, I’ve had many bugs and weird stringy things in my flour, too. Can’t they just nest somewhere else?! Thank you for the light bulb trick, Emilie. I will have to try this. I never thought the bulb in my oven would get the oven even slightly warm. I will definitely experiment with that one. If that fails – back to the radiator! I find that leaving my dough in the oven with just the oven light on maintains the perfect temperature and is draft free. Hi Shirley! This is an excellent tip too. Thanks for sharing! I tried the oven light twice, but both times, my dough overproofed and just did not work out. This tip might be great for some ovens but for mine, the light is much too warm. This has happened to me as well… you might want to leave the oven light on for only a few hours (jnstead of all night) and then shut it off. You can also try mixing the dough later in the evening to buy yourself more time in the morning. Hope this helps! Hi Elizabeth! Yes, I agree! It’s a great tip. Love the book…. If anyone hasn’t got it yet…. A must! We use a seed starter warming mat and that seems to work quite well. As you are experiencing, it’s been VERY cold where I live in northern Vermont (normal) and on the southeastern coast of Maine (abnormal) for the past several weeks. I’ve been baking all of our bread for over 40 years and since we’ve never lived in new or finished houses and almost always heated our houses and cooked on old wood stoves, I’m very familiar with (shall we call it) ‘fluctuating’ heat in the kitchen. In Montana the house was so cold I had to put my dough in my (airtight) VW Beetle on a south-facing driveway in order to get it to rise. In most places I just don’t let it sit over night – I start it early in the morning and let it rise throughout the day. In times when I have had access to a gas or electric oven, like Elizabeth, I found that simply using the light in the oven was enough to do the job. I’ve also experimented with DIY tricks like Mim’s great solar box, heating soapstones/pizza stones, warm towels, high shelves, etc. all to good effect and I make sure all my ingredients are at least at room temperature. The situation I find more challenging is the difference between high and low pressure or humidity – sometimes, you just have to wait a day to bake. I can’t imagine paying for a ‘proofing box’ – after all, humans have been figuring out ways to bake their bread for several thousand years without manufactured contraptions so our ‘superior’ modern brains and a little creativity ought to work just fine. Besides, a slow rise usually produces great texture! Tonight we’ll be remembering you with not only a loaf of your bread, but a simmering pot of Minestrone as well. Can’t wait! Stay Warm! I recently purchased your book and my sourdough starter will be ready in a few days for my first loaf! I’m so excited to try baking sourdough after spending way too much money purchasing it. I’m having the opposite conditions to many of the people posting – where I live it’s approximately 30 degrees celcius (around 90F). For the bulk fermentation overnight, would you recommend doing this partly on the bench and then in the fridge? Hi Jessie! Thank you for purchasing the book :) To answer your question, you can do a few things: use cooler water to slow down the rise, start the dough later than you normally would (I make my overnight doughs late in the evening when the weather is hot), and/or bulk ferment at room temperature for a few hours and then refrigerate the bowl overnight. As with anything, you’ll have to play around with these tips to see what works for you and your environment. But hopefully it will help! thank you so much for your book and for this website and Instagram. When adapting a bread from a yeast recipe to natural levain, how do you know much to substitute? i.e., is a tsp of yeast (assuming Dry Active or some other common yeast) the same as a quarter cup of 100 g of starter at 100 hydration? Hi Alan, this is actually a very good question and the answer all depends… Because a starter is made from water and flour, adding too much will change the consistency of the dough (whereas dry yeast would not). So depending on the recipe, this may or may not be a good thing. 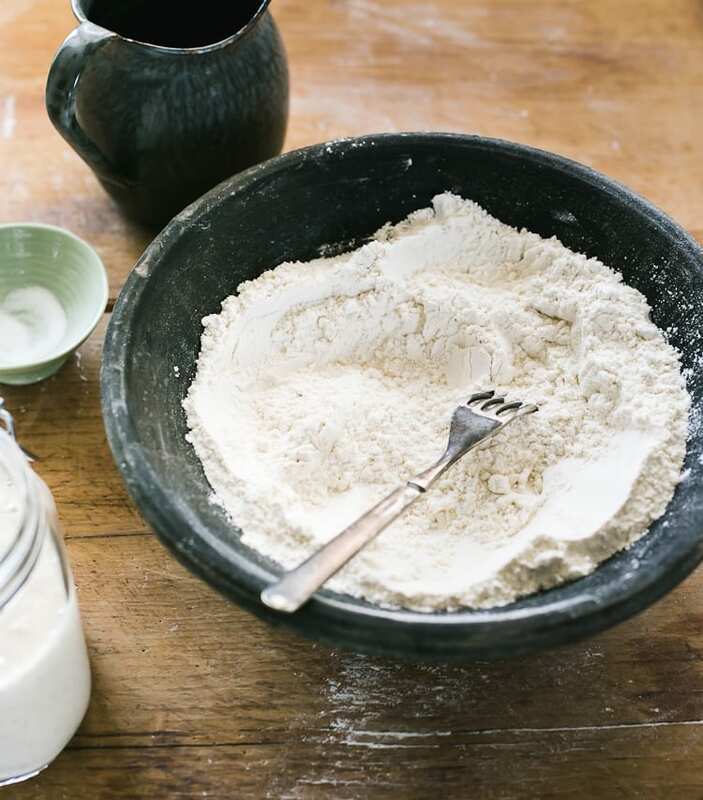 You might want to experiment with your example above, and add more flour as needed to create the consistency you’re after. Hope this helps! Hi Emilie, I purchased your beautiful book Artisan Sourdough after reading Celia’s awesome blog! Is it possible to for me to purchase I live in Sydney Australia? Hi Maddy! Thank you! I love Celia :) I can send you some starter- please email me your postal code so I can look up shipping rates. Thanks! Hi Emilie! Really enjoying your book so far! My starter isn’t passing the float test yet – do you think I should wait before trying to bake and just keep feeding it until it does pass? Thanks! Hi Haley! Glad to hear you’re enjoying the book. I would definitely wait to bake until your starter passes the float test. You’ll have better results this way! Hi. Thanks for your helpful article. I have a question or two though; my starter, made with spelt flour, is nice and bubbly, and definitely the texture of roasted marshmallows. However, it never doubles in size. It rises some, of course, but never doubles. Is it still active enough that my bread will rise properly? I have been having trouble with it rising enough, and am trying to identify my problem. Thank you! Hi there! If you’re having trouble with the rise of your dough, I would definitely have a closer look at your starter first. I recommend waiting for it to double in size AND for it to pass the float test. This is key. Based on your description, I think your stater needs to be more active for best results. So keep on feeding it and/or refer to this post for troubleshooting tips. Hope this helps! First of all, I love your Artisan Sourdough cookbook. My partner got it for me for Christmas and I’ve been working my way through the recipes with glee. I’ve run into a bit of a problem with a couple. I don’t know if my starter is less liquid-y, but I find some of my dough (primarily when made with whole wheat) drier than the recipe suggests it should be. The lack of rise and life in the dough is most likely also influenced by the temperature on my house. Would adding a little extra water totally throw things off? Could I be missing any other possible causes? My starter passes the float test and is very active, but my dough is still so dry! I just wanted to say thank you! My first true sourdough was so good it almost made me cry. 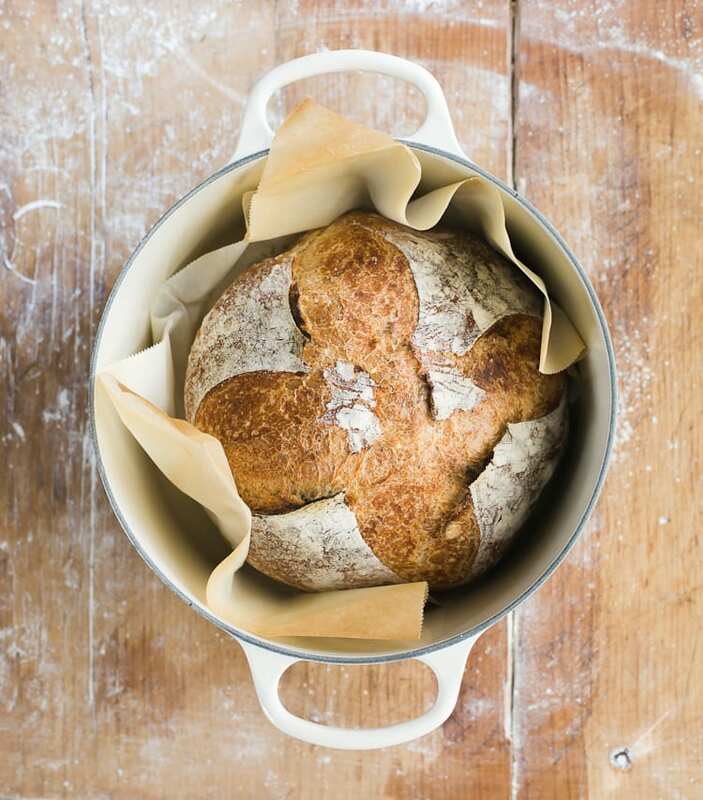 I’ve been baking bread for over five years now but I have never found a more useful resource than your gorgeous book (I hate myself for being so impatient that I bought the kindle version instead of the paperback which I would now love to have) and this amazing blog. My first loaf didn’t rise overnight (not because of Maurice, my beloved starter which you helped me build, but because it was too cold in the house) but the oven trick worked wonderfully and I’ve been using it ever since (and probably will until the warmer weather truly settles in). Thank you for such a lovely and beautiful book and the amazing gift of delicious bread! I am writing to you from Australia where I have managed some quite good results baking white sourdough following the techniques in your book “Artisan Sourdough Made Simple”. While the results are quite good and very eatable, and my loaves have plenty of aeration, the one issue is that they are a little dense and a little doughy, especially at the bottom. Is there something you can suggest that might overcome this? Hi Paul, it’s hard to say without seeing a picture of the loaf. And to be quite honest, it could be a number of things! However, if the dough definitely doubled in size during the bulk ferment, typically loaves that are dense and doughy towards the bottom might be undercooked. Or, there might be too much moisture in your bread (Aussie flours absorb water differently than American flours). Make sure to use an oven thermometer to troubleshoot your oven (adjusting the baking time if necessary) and/or cut back on the water by 20 g to start. See if that helps! Thanks for your suggestions. I’ll give them all a go and let you know what happens. The dough definitely doubles in the bulk rise. And I did bake my last loaf a little longer to see how it went and it was not quite so dense. I tried each of your suggestions with my last bake, cutting back on the water and adding a few minutes baking time to each step. The result was a much better bake— certainly less dense—a real improvement on my previous efforts. The only thing I didn’t do was invest in an oven thermometer and troubleshoot the oven. That’s next. Many thanks. I live in a very chilly house so getting my dough to rise was a challenge. I found that if i set it on my desk with a lamp above and a space heater below, I was able to get a very nice warm place for it to rise. I keep the dough covered with plastic wrap to keep it moist and keep a room thermometer there to be sure the temperature is right. This always works great for me. I’ve heard some sad tales of ovens being turned on and killing a dough or a starter by accident, and the oven temp does not stay stable the whole time anyway, it continues to cool after the initial warm up and not all ovens have lights in them. I hope this trick can help some people who are struggling. Hi, I have question, let’s say my sourdough starter is not ready after the first week, do I just keep throwing half away and feed it same amount of flour and water of what’s left in the jar? Hi Filip, I believe you will find the answer to your questions on this post: Troubleshooting Your Sourdough Starter. Hi Steve, glad you found this article helpful. Thanks for the feedback! In winter I always let my dough rise overnight at room temperature (instead of putting it in the fridge) with great results. Sometimes I have to play around with the start time, but other than that, it’s my go to method for colder temperatures. Just made my first loaf of Everyday Sourdough from Artisan Sourdough Made Simple. It was amazing. This was something I was terrified to attempt for years, and when I did, had little success. Due to my house temperature, it took longer to rise, (I put it in the warm garage overnight), and what a beautiful loaf of bread I was able to send with my daughter to share with her colleagues on the night shift at her hospital. I’m expecting I’ll get more requests for this bread. Can’t wait to move on to the other awesome recipes in this wonderful book. Hi Ann! That’s fantastic! I love reading about success stories like yours. Once you get the hang of it, or even over the initial fear, baking and sharing sourdough is one of the most rewarding things you can do. Enjoy! I just tried your walnut & raisin county loaf & it didn’t turn out too bad for my first bake. The dough rose wonderfully during bulk but the bread itself didn’t rise very much in the oven. Could it be that it was overproofed in the second rise? I gave it 20mins on the bench & then popped it in the fridge as I had to head out for a few hours. Would that have been my mistake? Hi Emilie – First of all, I am loving your book and my starter has grown very strong following your tips! This past weekend I made your Everyday Sourdough twice. I’ve used a number of the tips you include in the recipe (float test to make sure my starter is ready, using warm water, and I bought a scale to make sure my measurements are accurate). My starter didn’t rise over night (10 hours) but I don’t think my kitchen was warm enough. I don’t have a light in my oven, or particularly warm spot in my kitchen, so I turned my gas oven on low and alternated putting my dough next to and on top of one of the burners – so there was no direct heat but helped keep the bowl warm. My dough doubled in size and I tried the poke test, but it didn’t feel firm enough by the time I was shaping it/it had it’s final rest. I also had an issue with getting the scoring pattern to stay as the dough did not feel firm enough. I baked the dough in my dutch oven, it came out with a nice crust, crackles when you squeeze it, and some very nice airy holes, but I don’t feel that it rose enough. The loaf ended up being 11 inches round, but is only about 3 inches tall. It also seems that the majority of the bigger holes are in the top half. I read an earlier post where you suggested that it may be that the dough was not baked enough, but the bottom outside of the loaf is quite well done and I moved the rack up when I baked it for the final ten minutes outside of the dutch oven. Do you have any tips for helping my loaf rise? Was putting it near the stove a bad idea/could that have made it more wobbly, or do I need to use a smaller bowl for resting/pan for baking? Sorry for all of the info here but I’ve tried to identify a number of factors and need your help! This is my problem, too. It either the dough doesn’t rise or it over proofs. I end up with dense loaves. It’s frustrating because my starter is beautiful! So far though my only successes come from using the discard to make biscuits or pasta. Ok, so with bread: it’s always hard to diagnose without a picture, additional details, and being there in person to examine etc etc. But from what I’m gathering here, it sounds like your dough was over proofed. This could have happened during the bulk fermentation, the second rise, or both. I have a feeling it was during the bulk fermentation. Anytime you have a loaf that doesn’t rise a lot in the oven AND has large holes at the top is indicative of over proofed dough. Here’s what I would do next time: start the dough in the evening around 8 PM (assuming it’s winter and it’s about 68-70F in your house). 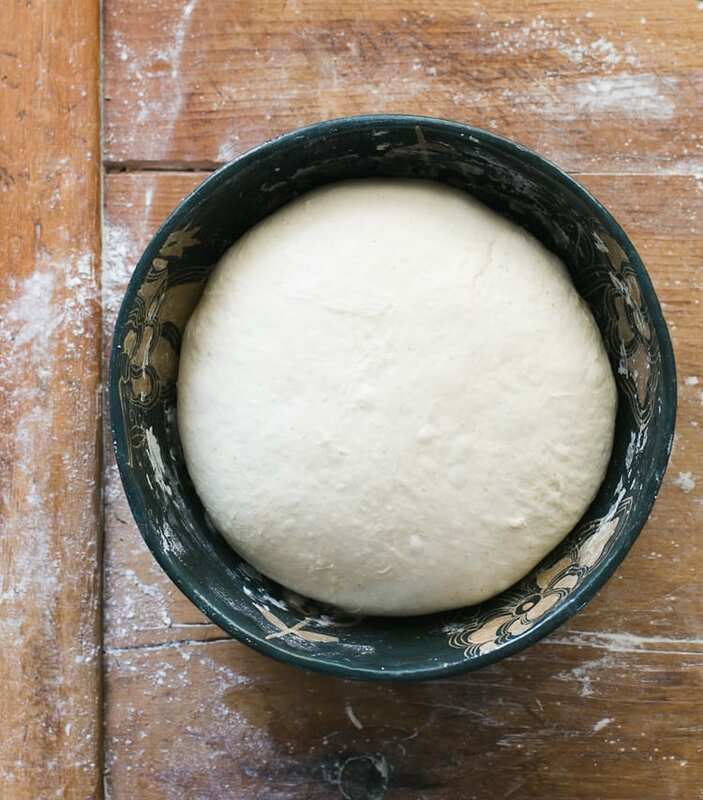 Rise the dough in an 8-inch pyrex bowl. This is exactly what I use. Skip the gas stove trick. In the morning, see how it feels… Firm? Wobbly? Did it rise too much? It’s going to take some experimenting. Shape the dough, give it a shorter second rise (appx. 30 minutes) in a proofing basket, and bake in the Dutch oven. Using a smaller baking pot will not necessarily solve your problem but it might help! Hope I’ve answered your questions… good luck! I have a really hard time on rising my dough. Even the trick eith the oven does not do much.. My starter is active, I even tested it and it floated. I used another recipe, but defenetly next time I’ll try yours. I had to leave my dough rise in the oven for 5-6 hours and did not see so much of a difference. It is always warm in there. Some help? Hi Elena, I’m not sure what recipe you followed initially, so I’m unable to advise! But in winter, when it’s cold, it’s not uncommon for your dough to look like nothing’s happening after 5-6 hours. It sounds like it just needs more time, which is normal. Good luck! my starter is runny, smells good and even tastes good. What do I need to do to save it?? Hi there! Please see this post. does the book have a recipe for a sourdough starter? It sure does! The book also comes with detailed information and a troubleshooting FAQ section. If you’re in a hurry, you can also order some starter from me directly. Click here. I had ordered one and cancelled the order…now I’m wondering if I should have or not for the collapsable proofer. The reason was I was looking over the negative reviews on the unit and some describe gaps between the folds of the square barrier that is used to enclose the dough. One person measured the internal temp and as a result there was fluctuation. What has been your experience? What about these gaps that let the air inside? I’m fairly new at sourdough making, only a couple years. My first year was filled with disasters. But I’ve learned a lot. One other oven method that I’ve found helpful when it’s super cold outside it to simply turn the oven light on. It generates a gentle warmth. It makes a nice proofing box.